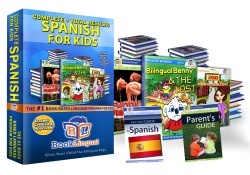 Give your child the bilingual edge with BookLingual Spanish for Kids Set. This package contains the world’s leading book-based language program for kids in a simple, easy-to-learn-from picture book format. Each eBook includes “read-aloud audio”, so that you can hear the books read to you in both languages. We will ship you the BookLingual Software CD, from which you can read any book on your computer, iPad, or other mobile devices. 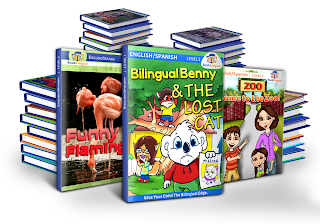 This Complete Set includes 32 full bilingual stories, with read-aloud audio, and games at the back of each book. There is also a helpful parent's guide for each level of the program. My girls are really enjoying reading some of the bilingual ebooks that come with this set. Lydia, my 5 year old, loves Biligual Benny and the Lost Cat best. She enjoys the story and repeating many of the words and phrases in spanish after we have read through the book. I like how easy it is to use. Although I personally prefer print books and don't like feeling tied to my computer, I must admit that the pdf ebooks and lessons in this set are simple to use, fun to read and can also be read on iPad or iPad mini. I love the read aloud option since my 5 year old does not read many words yet. She loves to sit and listen to the story read as she follows along page by page on mommy's computer. She also loves playing the games at the end of the books. This is a nice way to begin foreign language learning at a young age. Although we have not been using this program very long, she already knows many of the colors and several other words in spanish, and recognizes even more words when she hears them. This is a nice starter set for someone who would like to introduce Spanish to their young children.